Mitten View Campground is now called "The View Campground"
Monument Valley has reopened the campground with improved facilities at Mitten View. New to the campground are 30 RV sites without hookups, 30 tent sites and 29 cabins for those who want a little more in terms of camping luxury. The spot where the old Mitten View campground was is now a hotel called "The View Hotel". 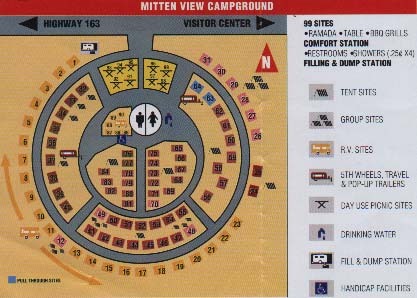 The new campground is about 1/4 mile from the hotel andyou can make reservations by clicking this link Mitten View Campground Reservations. In 2014, the rates are currently $19.99 per night for the tent sites, $39.99 per night for the RV sites and $179 per night for a cabin during the grand opening but most likely to go to near $300 after. I'm waiting for more information and will add it here when I get it. Just east of the campground is the most photographed of the formations in Monument Valley, West Mitten Butte, East Mitten Butte and Merrick Butte. Mitten View Campground is just over a mile south of the Utah border. You can take a 17 mile self guided tour in your car (make sure you have good shocks) or you can go on a guided four-wheeled drive tour. Check for availability at the visitors center. A 2 hour jeep tour runs about $20 per person. The best time to camp at Mitten View is during a new moon. The stars seems to rule the night sky, and you may never have the chance to see so many stars as you can here. Just across the border in Utah is Goulding's Lodge, a 1920's trading post. Nice accomodations are available as well as a gas station, general store and a restaurant. There is a small restaurant at the visitor center also. From Flagstaff, travel east on Hwy 40 to Hwy 89 (Page, Grand Canyon Exit). Travel north on Hwy 89 to Hwy 160 (the Tuba City Exit). Travel east on Hwy 160 to Hwy 163 (the Kayenta exit). Travel north into Utah to Goulding's Lodge then take Indian Route 40 southeast to the Monument Valley entrance. 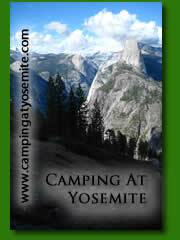 the campground is just south of the visitor center.